GREEN BAY — The pads go on tomorrow, and in a game dedicated to player safety and a limited number of full-contact practices, Packers Head Coach Mike McCarthy says there is still in place in football for guys who want to hit. “I think players look different in pads. They play different. It’s definitely a turning point; no doubt about it. 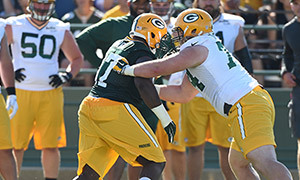 Padded practices are the closest you can get to games,” McCarthy said following Friday’s practice, the second of training camp. The first two practices have been in light gear. Saturday’s practice may or may not signal the start of half-line drills, the most popular contact drill of training camp. “We’ll do half-line in training camp. It’s an inside-run period. I really never liked nine on seven; you have unblocked players on defense. You want to lower risk. Your ability to go half-line is you cut the drill in half,” McCarthy said.